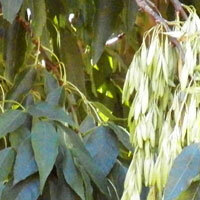 Large tree with opposite, compound leaves. The leaf rachis is flattened and wing-like. 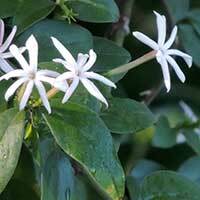 Scrambling vine with opposite, compound leaves and fragrant, white flowers with long tubes and five lobes. 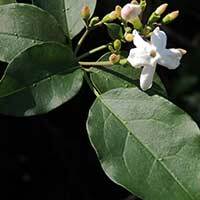 Vine-like forest plant with dark green trifoliate leaves and white flowers with long tubes. 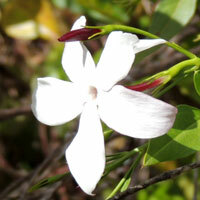 Woody vine with simple, opposite, dark green leaves and fragrant flowers with long, slender tubes. 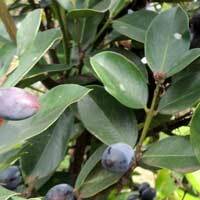 Medium to large dark green tree. Smooth margined, opposite leaves without stipules. Purple drupes with one hard seed. 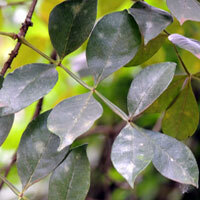 Large tree with opposite, compound leaves planted for forestry and landscape. Native to N. America. Seeds with elyptical, papery wing. By no means am I an expert on the Natural History of Kenya because I am so new to exploring this part of the World. By creating a page for the species as I learn them I am teaching myself, sharing with others and happy to receive feedback from web site visitors.